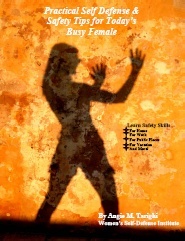 Practical-Self-Defense-E-Book for Today's Busy Female! Our practical self-defense e-book provides valuable safety skills for home, work, public places, vacation and more! We have finally finished our e-book - Practical Self Defense & Safety Tips for Today's Busy Female. This e-book has over 150+ provocative women's self defense tips. Criminals have a plan when they commit a crime. So should you in order to avoid becoming the next target and victim. Pay attention to your environment. Focus on where you are going. Don’t get lost in your thoughts. Look around you to see if there are any potential problems. Worry about strangers hanging around your car; why are they there? Don’t talk on your cell while you're walking to your car or strolling along on the street. Keep your head up and make eye contact. Act in a way that says "Don’t Even Think about It" to any criminal hanging around. First, do not be oblivious to everything around see - see #1. Second, do not act scared. Third, make eye contact and don’t slouch. Fourth, speak up and look at folks. While it’s okay to be a free spirit and spontaneous, even butterflies have plans when attacked. Be prepared. You know that if you are confronted, you have a plan on how to escape and your next steps. Scan for exits wherever you are. When you're home, have an escape plan with your family. Although most of us aren’t Neanderthals, our instincts are still an early warning system. Our instincts are an intrinsic early warning system hardwired into our DNA. Don’t ignore your feelings that the group of mooks hanging across the street could be trouble or that your "date" is overly friendly. Take the time to learn self-defense. When attacked, don’t ever stop fighting back. You don’t need years and years of martial arts training based on fine motor skills to be effective. The simple moves based on gross motor skills are extremely effective. We may ruin that manicure, but we’ll also be alive. In any confrontation, expect to get a scratch, bruise, broken bone, or a cut trying to escape. Unless you know how to use one effectively and are always carrying, have a back up plan. The best weapons you have are your brain and your body. Although we have been properly trained in the rules of etiquette; and are exceedingly polite and considerate to all of those around us, once confronted, all bets are off. Yell "stay back", "no", "what do you want", "I don't want any trouble." Get your copy of Practical Self Defense & Safety Tips for Today’s Busy Female today and learn more. As a thank you, you will also receive a 20% discount certificate to our classes at Women's Self Defense Institute and a 10% discount on all personal safety products at EasySafety4U.